Brew City offers a beer inspired seasonal menu featuring fresh, local ingredients. Our unique dishes are created and crafted from scratch. 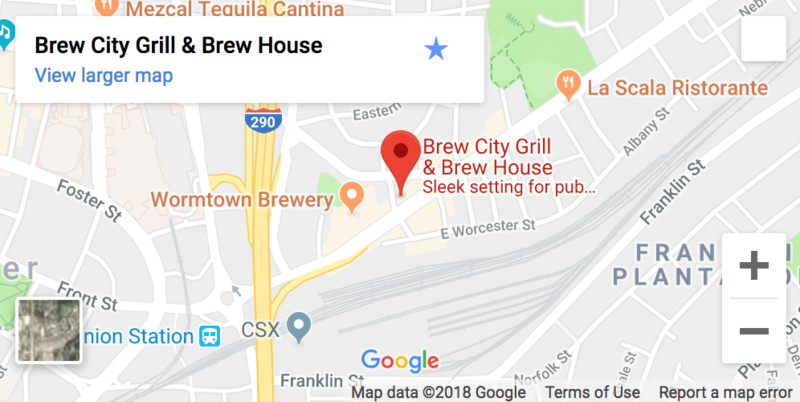 In addition to our seasonal, lunch and dinner menus, Brew City also features a burger menu recognized for excellence by major New England media outlets.. enjoy the ultimate burger experience. Hand breaded colossal Spanish onions. Served with zesty dipping sauce . *Cooked to order. Consuming raw or undercooked meats, poultry, seafood, shellfish or eggs may increase your risk of foodborne illness. All weights prior to cooking. Please inform your server of any food allergies prior to ordering. No separate checks for parties of 8 or more. Twin John & Sons medium sausage patties loaded with provolone cheese and topped with sautéed peppers and onions on a butter toasted ciabatta roll. Half pint meals include choice milk, orange,cranberry, pineaale or apple juice or soft drink with lid. Free refills on soft drinks only.Must be 10 years old or younger. Happy hour just got happier…come enjoy these $5 specials ALL DAY … EVERY DAY! Domestic 14oz drafts are only $3.00! Kitchen closes one hour before closing time.